Oriana Fallaci was the legendary Italian journalist known for her confrontational interviewing tactics that came to be known as ‘La Fallaci’ style. She punctured the grandiose trappings of heads of state, she skewered the vanity of film stars from Cannes to Hollywood, she exposed hypocrisy, political and otherwise, where she found it. When she wasn’t reporting from around the globe, she wrote bestselling books and had torrid romances. Biographer Christina de Stefano has written a fine portrait of Fallaci that is indeed, a la Fallaci, in its sharp journalistic style. And Fallaci and her times live on in these pages. She grew up a studious and rebellious Catholic schoolgirl in Italy in the 30s as Mussolini came to power allied with Hitler’s fascist regime. Her parents, Edoardo and Tosca, were active in the Italian resistance, and by age 14, Oriana was herself a stealth courier for the Partisans, bravely delivering freedom leaflets and hidden weapons on her bike through Nazi roadblocks. As poor as the Fallacis were in wartime, they still kept a library, and Oriana became an avid reader. Her favorite author was Jack London. Edoardo, a carpenter by trade, was held at one point and tortured for information on the resistance. Oriana watched her mother save him from being executed, when she threatened one of his captors to expose his previous allegiance to anti-Mussolini resisters. The Fallacis even hid two British soldiers in their home for two months at their own great risk. Fallaci soon became a star journalist for L’Europeo covering celebrities in Rome in the early 50s when the Italian filmmakers were igniting the industry with neo-realism. Fallaci was already renowned for casting a jaundiced eye at the culture of celebrities, yet she was respected as much as she was feared and adored in equal measure by celebrities. In Hollywood and New York, she had many detractors. Frank Sinatra and Marilyn Monroe didn’t give her an interview. Yet Fallaci delighted readers, recounting her failed efforts to corner the elusive stars. She hailed Jayne Mansfield, who didn’t try to be anything she wasn’t, but ripped apart Kim Novak as being a studio manufactured star. Back in Europe Fallaci returned to pursuing assignments about humanitarian crises, social injustice, and oppression of women around the world, as well as pursuing interviews with world leaders, however risky or insulated they were. Fighting fascists of any stripe was a vocation she accepted her whole life as an equally fearless international correspondent for 40 years, often working in the most dangerous conditions. Her global beat took her to every hot spot from Saigon to Teheran to Karachi to Bolivia and inside the vaulted political arenas in Washington, London, Tel Aviv, China, Moscow, and the Vatican. Fallaci also made time for a personal life full of high drama. Her first epic romance was with war correspondent Francois Pelou, during her assignments in Saigon, headquartered at Agence France-Presse where Pelou was bureau chief Francois Pelou. After the end of their affair she relentlessly pursued international journalist Alfredo Pieroni. He wanted something casual; Fallaci turned their affair into an almost fatal attraction. She insinuated herself into his work life, typing his manuscripts and trying to act as his agent abroad. He tried to cool it off, openly dating other women and coldly avoiding her. Fallaci became so distraught she had to seek treatment for a nervous breakdown. Bouncing back, she threw herself into journalism and also wrote three novels, one of which, Penelope at War, was an autobiographical roman à clef of her tragic love affair with Alfredo. It helped her move on, and she became noted for her openness about sexuality, although kept her many affairs private. Her later years were filled with other failed relationships, personal tragedies, and illness connected to her lifelong smoking. Whatever the problems, she would relentlessly continue her work as a journalist and writer. Her last years were consumed with an exhaustive generational history of her family, interviewing any surviving relatives to piece all of the pieces together going back generations, knowing the whole time she probably would not live long enough to finish it. Author de Stefano takes us inside Fallaci’s turbulent personal life and her formidable accomplishments as a skilled and courageous foreign correspondent. 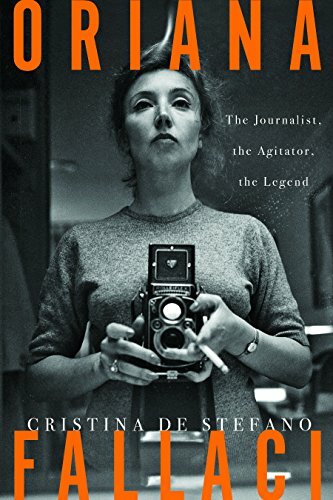 It is a potent reminder that real journalists were valued for much more than a sensational scoop or headline, and like Fallaci they put everything on the line at great personal cost for their chosen profession and craft.